I am in the process of replacing every single air register in my house with wooden ones, with every one of them being different from the others. I was given a piece of 1/2” thick mahogany a few months ago and it was begging to become something, so I edge glued up two pieces and started work an hour or so later. That evening, this replaced that ugly metal screen. I call the design “Art Deco”. It’s 10×16 inches and a tad less than 1/2” thick. To keep one from seeing the nasty pipeworks behind, I placed a double layer of window screening across the back – air still flows quite freely. Finish is simply rattle-can lacquer. Affixed to the wall with a square of stick-on Velcro at each corner. looks great. I’ll be curious a few months down the road how much dust builds up on those window screens that would normally go to the air filter. Hopefully it doesnt become an unsightly dusty mess. Hey Bob, that is so cool. I like it. You got skills. p.s. Please do not let my wife see this. That is a piece of art hiding what would be somewhat unsightly. No one wood suspect that to be an air return (pun intended)! Just beautiful, I love the design. Good idea for speaker cabinets too. Excellent !!! Looks a little Frank Lloyd Wright to me. 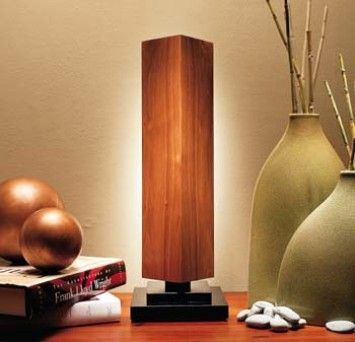 You need one of his Falling Water table lamps to go with it. Another thing to go on my Must Do list. Looks fantastic Bob. Good design and warm wood. That is an elegant solution for an essential part of your home HVAC system. Great job. Man, I hope my wife doesn’t see this…. She has me doing enough. Really a nice bit of work. I’ve been unhappy with the air registers in my house for some time … WONDERFUL IDEA. Not sure if I can do as well as you have here, but I believe I will try. Great stuff! I do question the velcro, though … why not use more traditional fasteners? I would think the velcro would lose adhesion over time.